I wonder if any of my friends would believe me if I told them that I was Shatrughna one time. And Dusshaasana too. Both male roles, all bravado and swagger, no feminine graces or smiles. As Shatrughna, I was destined to be defeated at the hands of my young nephews. But I gave that fight my all, ultimately getting routed by the two youngsters who chased me away. As Dusshaasana, I was the bigmouth, shouting insults at decent folks, strutting around the stage, intimidating people with my sheer size and big walk. Of course, at the end of the show, I was downed by Bhima (played by Chitra, a fellow dancer), mad with rage. I put up a tough fight. We went on for a long time, circling each other, mocking each other… taking out our clubs, finally using our bare knuckles and going all out. But I was killed, nay slaughtered. Had my guts ripped out, blood and gore pouring forth… Bhima was happy. The magic of Kathakali is irresistible. 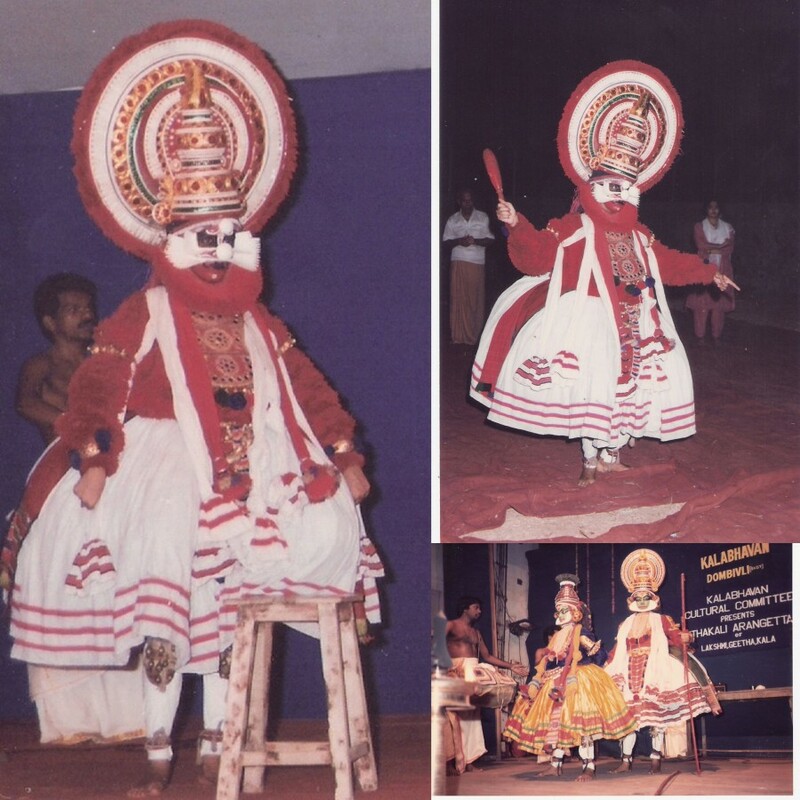 A classical dance form of such finesse and refinement… to the uninitiated, it appears like an incomprehensible mix of intricate hand gestures, deft eye/hand movements, strong footwork, massively resounding drums, cymbals and conches, huge performers wearing elaborate costumes and makeup and more. However, to the crazy and devout few, Kathakali is absolute beauty, unfolding on stage with grace, power, strength and style! It is only love for this classical art that makes fans sit through nights and nights of performances, braving the heat and humidity, battling the relentless mosquitoes, fighting sleep. Only to rise in the morning, go home, catch a few hours of sleep, and then head back the following evening for the next performance. Kathakali performers (male characters) are larger than life, literally. As Dusshaasana, I was a virtual giant on stage. My crown was a majestic white-red affair, towering over my head in sheer splendor. Every other character cowered before my bravado. Who'd think that underneath the starched cloths, velvet shirt, fearsome red face paint and long silver nails was a meek college-going girl? 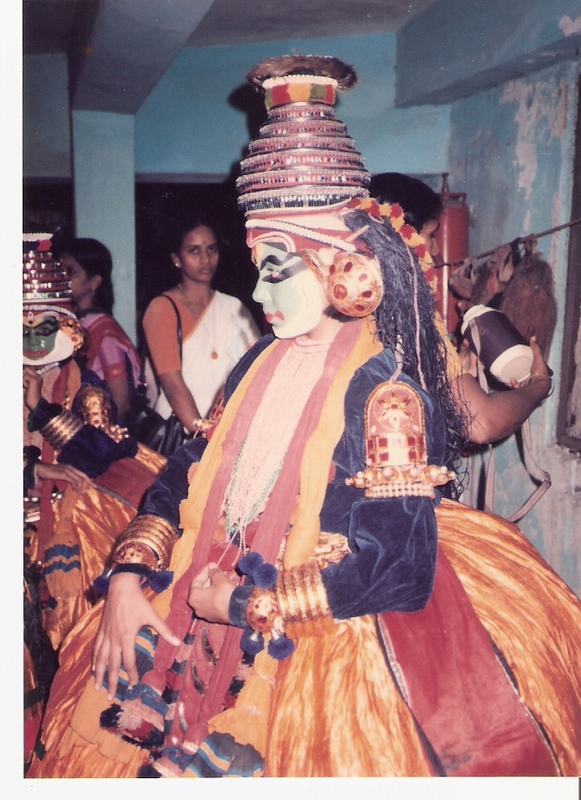 I have had such a good time learning and performing Kathakali…. I could never express completely how much I love this dance form. 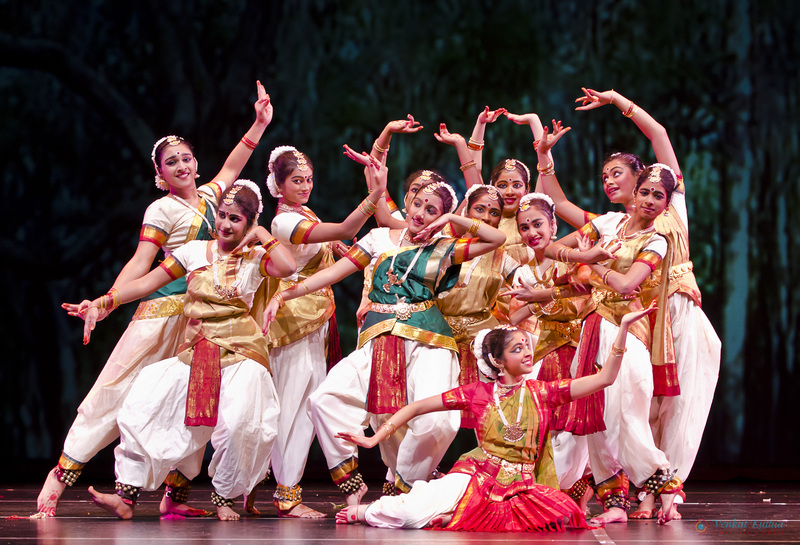 After learning for a few years, I thought that I must learn a more feminine style of dance, so I began to learn Mohiniattam. 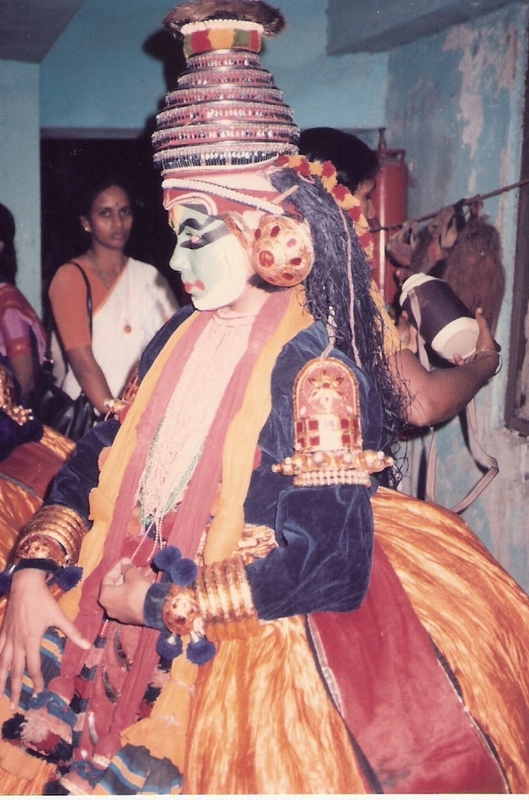 Now this is an utterly feminine dance, almost the polar opposite of the masculine strength that Kathakali embodies. I realized soon after, that I liked the masculine grace of Kathakali a whole lot more than the feminine sweetness of Mohiniattam! Fun times, such fun times. Getting to the venue early in the day, lying supine on the floor getting my face painted and make up done, having countless starched cotton cloth bits tied to my waist (praying all the time that I wouldn't need to pee… for the next 5-6 hours! ), donning the velvet shirt, burnished gold ornaments, long silver nails… and then finally wearing the giant crown, the one that established my character… A nice guy on the side of justice, a villain disrobing women or anyone else. Then walking to the stage, touching the musical instruments in obeisance, praying for stamina, courage and grace so I could pay my respects to the stage and my art in the best way possible. Oh such fun I have had… Wonder if I will have the fortune of inhabiting those characters ever again.